Our lab offers a full spectrum of testing and assessments that may be utilized in research protocols. Testing and assessments for all ages may be administered within our facility. The research in our lab focuses on effects of nutrition and brain development and function throughout the lifespan. We have studied breastfed 6-month olds to determine how the mother’s genotype effects brain development. Most recently, we have enrolled 65 to 79 year-olds who are experiencing mild cognitive decline to see if supplementing their diet with blueberries slows down the effects of memory loss. Whether you are a participant interested in what goes on during some of our research studies, or you are a student who would like to be part of our lab, check out How The Science Works at the Cheatham Lab. The dense array electroencephalography (dEEG) is a recording of brain activity. Brain cells continually send messages to each other that can be picked up as small electrical impulses on the scalp. 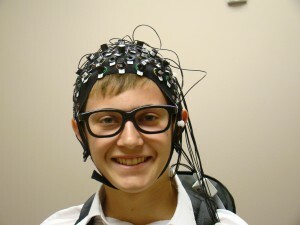 The process of picking up and recording the impulses is known as an EEG. This procedure tracks and records brain wave patterns. 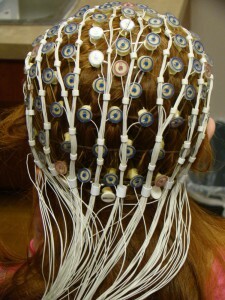 The Cheatham Lab uses the Dense-Array Electroencephalography (dEEG). The participant's head is fitted with a stretchy net of soft-spongy sensors that has been soaked in a warm sali ne solution. The sponges on this net touch the scalp and enable us to record the electrical activity generated by the brain. After the net is in place, a few moments will be spent getting the cameras adjusted to track your eye movements. Then you will sit in front of a computer screen and watch pictures on the screen. While you are watching these pictures, we will be recording the brain activity (electrical impulses) at the scalp as well as the information from the cameras. 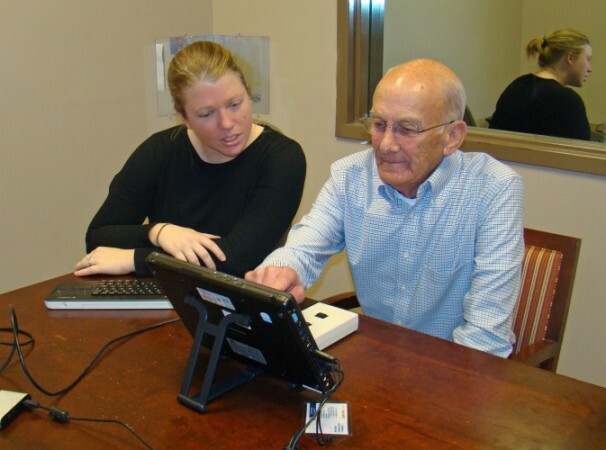 The dEEG technique can monitor and interpret the brain’s electrical activity in infants through the elderly when combined with computer-based activities. The dEEG tells us when the brain is active and how active it is. In the video to the right, Independent Tribune reporter Ben McNeely's brain waves are measured by Dr. Cheatham. During the test, McNeely pushes a button when he sees a certain shape appear on a computer screen while an electrode sensor net reads his brain activity. Elicited imitation is a low-tech testing method used in the Cheatham Lab. 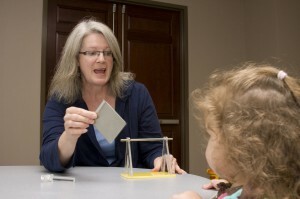 In the Cheatham lab, we use Elicited Imitation to test declarative memory in children beginning at 10 months of age. 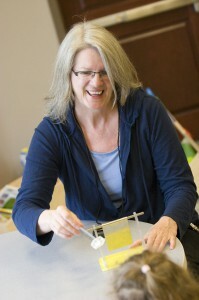 With this method, the researcher models the sequence of steps used to assemble a working toy. The child then has the opportunity to demonstrate to the researcher whether she or he can remember how to put the toy together. Altered fat tissue distribution is associated with increased inflammation, cardiovascular mortality, and cognitive impairment. In certain studies, we use dual-energy X-ray absorptiometry (DXA), a safe and non-invasive technique to measure body composition including lean mass, fat tissue mass, and bone mineral density. This technology is very accurate and precise. DXA has become the new “gold standard” because the results are extremely repeatable, and it has the ability to show exactly where fat is distributed throughout the body. In general, a patient without coverage can expect to pay a couple of hundred dollars for the procedure. Many participants see this as a benefit when DXA is used in a study, as they will receive the scan as part of their participation. The full reports will be given and explained to them. During the scan the participant simply lies on a padded table and an arm scans the length of his or her body. The whole process usually takes less than 10 minutes and gives us a significant amount of important information! Near-infrared spectroscopy (NIRS) is a non-invasive neuroimaging technique that uses light to measure blood flow changes in the brain. NIRS uses source and detector optodes to indirectly measure brain activity as light travels from the source optodes through oxygenated and deoxygenated hemoglobin and back to the detector optodes. The distribution of blood flow throughout the brain can tell us which areas are activated when done while completing a task. For example, areas with increased oxygenated blood are more active. The NIRS system is portable and suitable for children and adults. The NIRS cap, similar to a swim cap, contains 128 spots for the optodes to be placed, allowing the researcher to measure from any area of the brain. For more information about NIRS, please see our post in Lab Updates.